Mike Tanner, who produces the excellent L.A.-based blog Dinerwood with reviews of coffee shops (especially ones serving pie), and I met up for breakfast in Whittier. The site was Jack’s. Is this Jack’s connected with the one that used to be at 19th and Carnelian in Rancho Cucamonga? I suspect so, although I don’t know. Mike and I had met up a couple of times before, once at Roady’s in San Dimas, the other time at LeRoy’s in Monrovia. He tossed out a couple of options for a third get-together and I picked Jack’s based primarily on its amazing out-of-the-past sign. Love the Erector-set pole too. There’s a great, long counter inside with swivel seats in the classic style. We got a booth and hunkered down for what turned out to be an only average meal. The corned beef hash with my eggs was the best part and it was probably out of a can. The country potatoes were mushy, not crisp. Mike wasn’t blown away by his waffle. Service was inattentive. We skipped the pie. Conversation was the highlight. Well, that and the sign. Here’s Mike’s take, with lots of photos. He was no more inspired by Jack’s than I was. 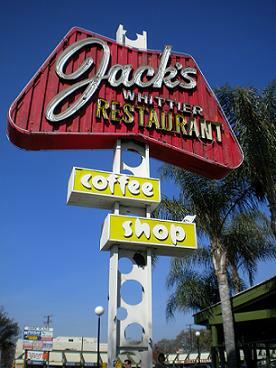 I remember at the time that there was a Jack’s in Whittier listed on the Jack’s in RC menu. There is a similarity in the pictures for the Whittier Jack’s to what I remember of the RC one. So, I’m certain they were related at the time. The RC one was converted from a Bob’s Big Boy. It was torn down and replaced by a larger building with a dentist, liquor store, used game outlet, and Starbucks. Since you and your cohorts are going out-of-town in your restaurant pursuits, I would like to suggest Blue Agave in Yorba Linda. I have never been there myself–I attended a special event in our area, that was catered by that restaurant. It was delicious mexican/southwestern fare, with margaritas too. Yum! Do they still have a toaster at every booth?